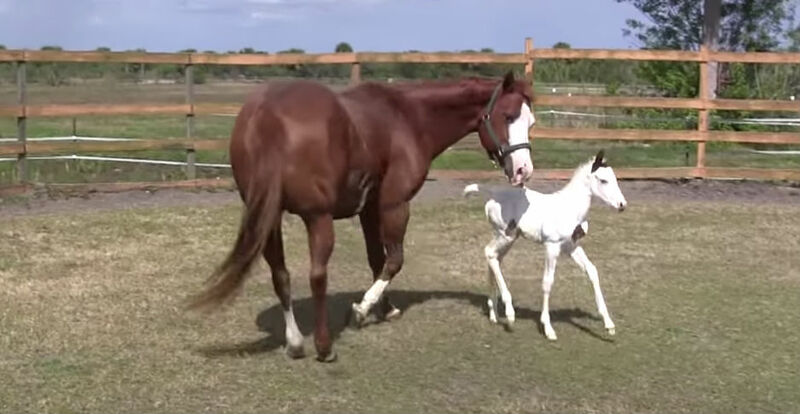 Mother Horse Gives Birth To Rare Filly, Shocks Everyone With Her Face Pattern! A couple from Melbourne, Florida; Jackie, and Scott Nelson, are known for breeding the most beautiful paint horses in town. Jack and Scott also own a riding ranch called “Down Under Colour. ” Their horses usually take home the prizes in different championship shows. 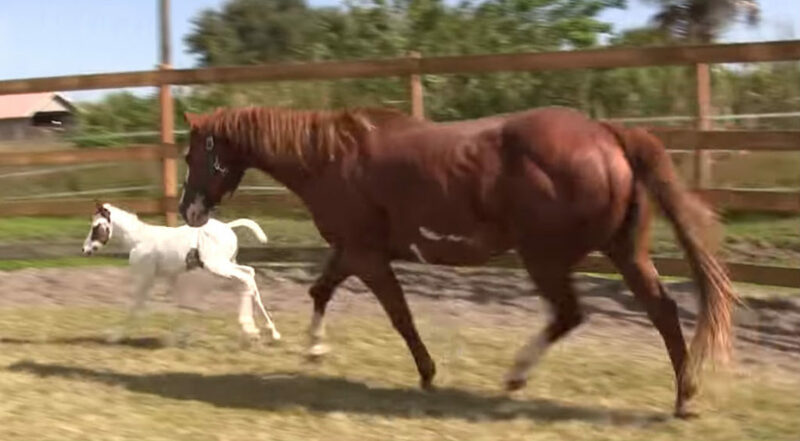 When one of their horses got pregnant, they already know what to expect. They have been assisting horse births for years so this should not be different from what they experienced before. They named her “Coconut” because of her white and brown color. But what made Coconut more special are her extremely rare color markings that had great significance in the older times. A War Horse is considered very important in the Indigenous culture. The Indigenous Legends especially the Plains mythology, often mention the Medicine Man. He is both a priestly healer and a spiritual guide. He would help heal the tribe of any physical and spiritual problems. The Medicine Man is believed to have a very strong connection with the supernatural creatures, animals, plants, and also the other elements of nature. Men who are considered for this position would online ride a certain type of horse. However, horses need to have very specific markings and characteristics for them to be considered a War Horse. They should be completely white in color with only small patches covering their ears as well as the top of their heads. These markings are called “Medicine Hat” or the “War Bonnet. ” It is very important for the War Horse to have these required markings but there are other markings and characteristics that would make them more special. Aside from the markings mentioned, War Horses also need to have at least one blue eye or what the indigenous mythology call as the “Sky Eye. ” The tribes believe that if the Medicine Man is killed during a battle, the horse’s blue eye would carry the Medicine Mans’ spirit back to the Gods. The tribes also think that War Horses have special powers. They believe that the War Horse has the ability to protect the Medicine Man in battle and also warn others of incoming dangers. They are also considered as “hunters” because they can track rare game hiding even in the forests. Wind Chaser Ranch states that tribes would usually steal the War Horses of other tribes because they have some of the groups’ “good magic.” By stealing it or by killing the Medicine Man, they would be able to weaken the defeated tribe and take their luck. Because of these, the War Horses are closely guarded because they are very important to the tribe. We also have seen Indigenous warrior put brightly colored war paint on their War Horses and they use specific patterns and symbols because they believe that this will serve as protection and bring the tribe victory and luck. One of the most common is the circle around the horse’s eye which symbolizes alert version. There is also a handprint on the chest to signify that he previously knocked down an enemy. Upon realizing the Coconut was a rare filly, they immediately took a video of her and uploaded it online. It has been five years since they shared Coconuts’ video and there is no doubt why the clip gained over 3 million views! She is a rare beauty and her owners are very proud of her!